In the land where the homes have names rather than numbers, the Kolbes had become accustomed to the typical requests of their clients. One was usually to increase the total volume of the current home. 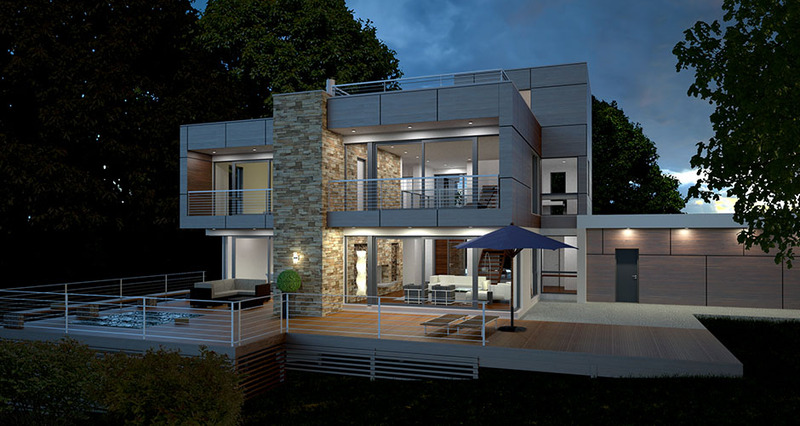 Another was to create a modern house with highly efficient construction methods and loads of natural light. The final, very important requirement was almost always that no British construction workers be present during the building process. And so began their conversation, in 2009, with family M (the owners would like to remain anonymous), sitting in the living room of their soon to be demolished 1960’s home in the beautifully charming historic English market town of Marlow, home to about 14,000 residents. The property, in the second row, just a stone’s throw from the river Thames, is narrow at the street, widening to the back, provides a wonderful south-facing backyard, absolutely ideal in terms of passive solar design which is always a point of departure for the Kolbes when designing a new home. The flip side of the location of the new home is the fact that Marlow is a quaint Georgian town with many historically protected buildings, one of which, a half-timbered Victorian house, is located directly across the street. While this did not mean certain failure with the city’s building officials, it did mean coming up against initial resistance with the neighbors. After having successfully run an architectural firm in Berlin, Germany for well over a decade, Alexander and Michelle moved to the UK in 2004, and 2005, respectively. Consciously stepping away from the large commercial and retail projects they had focused on during the 90s in Berlin, they welcomed the opportunity to concentrate on providing their decidedly modern approach to residential architecture to a thriving niche market in the UK. Building on Alexander’s many years of experience in the area of prefabricated housing, they collaborated for five years with two German homebuilders to secure the production and delivery of their designs at the utmost level of quality. For this particular project, they teamed with the innovative and esteemed company Baufritz, founded in Germany in 1896. “We worked very closely with Family M to create a home to meet all of their lifestyle wishes, design ideals and spatial requirements,” explains Alexander Kolbe. Raised on a concrete plinth to meet the local flood zone requirements, this home presents a proud, but inviting facade to the street, while opening generously with a folding glass wall and abundant glazing to the large wooden deck and sunny private garden. Paying an homage to the Bauhaus movement, and to the previous bungalow located on the site, the home’s flat roof, mineral stucco exterior and dark window frames, as well as the sensitive articulation of the building volume in relation to the surrounding homes and the carefully considered window proportions, combine to create a stunning example of modern architecture for the city of Marlow. The functions of this five bedroom, three and a half bathroom home with generous, flowing living areas and an open concept kitchen, are arranged around a beautiful, naturally lit feature staircase which serves as the heart of the home. Despite the home’s substantial footprint, the orientation of the rooms, paired with the naturally lit central circulation area, help to create a bright and friendly atmosphere for every area of the home. The design takes advantage of the available width of the property, while the functions are organized in a way that ensures that possible overlooking of the neighboring properties has been avoided, a major issue when planning a home in the UK. While the home’s appearance and day-to-day performance were high priorities, Family M placed very high value in the sustainable aspects, particularly in the use of only non-toxic building materials and carbon neutrality of their new home. Avid readers of “Grand Design”, they chose Baufritz to be the manufacturer after reading about them in the magazine’s article. Trailblazers in the world of ecological timber construction for the last four generations, Baufritz excels in the areas of health, ecology, quality and innovation. Their enthusiasm for supplying clients with the highest quality home possible at multiple levels is contagious, so much so that the Kolbes collaborated with them on over twenty residential projects during their five-year stay in the UK. The family M home was built in 2010. All large elements such as the R-35 walls, ceilings and roofs panels were prefabricated on a computer-controlled production line. Triple-glazed windows and doors were fitted in the factory to 100% accuracy ensuring that no harmful PU foam fillers were required. Solar collectors on the roof heat the water and photovoltaic panels (PV) generate electricity. All interior fittings and finishes were chosen for their high quality and emphasis on health and sustainability. Family M was able to move into their completed home at the agreed upon date without the usual delays and budget overruns so common with traditional on-site construction. Today, nearly three years later, they rave about the comfort, beauty and incredible energy efficiency of their new home. Retrospectively, this lovely home and many others built during the Kolbes’ sojourn in England, with their exceptional build qualities, and the manner in which they were designed, manufactured and delivered, serve as models for all they now endeavor to achieve with their company, evoDOMUS, here in America. Upon arrival in the States early in 2009, they were pleasantly surprised to see incredible consumer and manufacture interest in environmentally safe products and sustainable building methods, as well as passive and net-zero projects. Since then, that interest has steadily grown into a true movement with, in their opinion, enough momentum to sincerely raise the bar in the residential building market. “We are overwhelmed with the positive feedback we are now receiving, it seems we are offering the right service and product to an interested, as well as informed public, at an opportune time.” explains Michelle Kolbe. Founded in 2011, evoDOMUS is their answer to the least complicated way to provide the most customized, ultra-energy efficient and healthy home today, all at a reasonable price within an established period of time. Through their collaboration with the New Hampshire based company, Bensonwood, premier designer/builder of energy efficient, high performance homes across the US and Canada, they are able to offer their clients the benefits of their over twenty years of international experience in the prefab industry as well as access to a network of talented and highly professional engineers, consultants, and local contractors, all with a single point of contact. evoDOMUS strives to remove the stress factor from the home building process. With designs inspired by the Bauhaus movement and Mid-Century modern architecture, evoDomus caters to homebuyers who are inspired by clean, contemporary design as well as energy efficiency. They simplify the home building process by managing all aspects of the project from site selection to moving in. Their comprehensive service package provides all services under one roof; design, permits, site preparation, foundations and the construction and finishing of their homes – enabling their clients to realize their new homes smoothly, quickly and at a fixed price.